The Forbidden City's Last Secrets Head to the U.S.
"Now we can go into the wild," says Nancy Berliner as we step into a garden overgrown with waist-high weeds in the center of Beijing. This is no abandoned lot, but a largely untouched corner of the Chinese capital's famed Forbidden City. Nearby, hordes of tourists plod across the vast imperial plazas. But in the garden, the only swarms are mosquitoes. Amid the 20-ft. high rockeries, groves of bamboo grow virtually unchecked, and a wild wolfberry plant with ripening fruit stands in the middle of our narrow pathway. The Forbidden City takes its English name from the fact that in imperial times it was truly off-limits: no one could enter and leave except with official permission. The 1911 revolution changed all that, and the Palace Museum, which was established in 1925, now sees more than 8 million visitors every year. 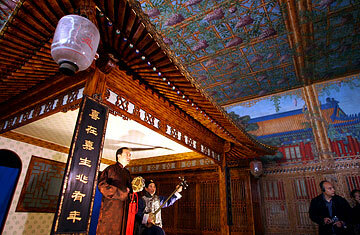 But due to the Forbidden City's massive size  its 179 acres house 980 buildings  some of it remains closed to the public. Those still-forbidden parts of the Forbidden City include much of the Qianlong Garden, built in the late 18th century as part of a retirement complex for the powerful and long-ruling Qianlong Emperor. While 27 structures have been maintained in the garden's exteriors, their interiors have been left largely untouched for most of the past century. Now, this "jewel of the Forbidden City," as Jin Hongkui, the Palace Museum's deputy curator calls it, is slowly being refurbished through a collaboration between the museum and the World Monuments Fund. And as part of that project, 90 recently restored objects from the garden will travel to the U.S. this fall for shows at the Peabody Essex Museum in Salem, Mass., the Metropolitan Museum of Art in New York City and the Milwaukee Art Museum. Many of the 18th century objects that will be displayed are symbols of the Emperor's devout Buddhism. They include a hanging panel filled with niches that hold intricate figurines of Buddhas, deities and historical teachers from the Tibetan Buddhist sect to which Qianlong belonged. There is an elegant lacquered screen covered with images of luohan, enlightened disciples of the Buddha depicted with exaggerated facial features, and a fascinating two-ft.-tall cloisonné mandala, used as a visual aid in meditation. While treasures from the Forbidden City have traveled to U.S. before, this show is unique in that the objects have only been seen by a handful of officials, museum staff and other experts since the last Emperor left the Forbidden City in 1924. "They've neither been displayed in China or abroad. They've never been seen before," says Berliner, curator of Chinese art at the Peabody Essex Museum. "They're also from a part of the Forbidden City that's so different from the rest of the Forbidden City. These objects were made for a context that's about being contemplative. It's not about being big, official, national, a victorious ruler or emperor. It's about being a scholar and a Confucian and a Buddhist." The U.S. tour starts at the Peabody Essex on Sept. 14. Palace Museum officials had previously visited the Massachusetts museum and were impressed with the Yin Yu Tang, a late Qing dynasty house that was relocated from China's southeastern Anhui province and rebuilt on the museum grounds. That connection eventually led to the decision to show the garden's restored items at the Peabody Essex, though some Chinese have complained that the objects should have first been put on display domestically. But Feng Nai'an, assistant director of the Palace Museum, says the overseas exhibitions are important to raising international understanding of the Forbidden City. "Our preservation work is relatively well known within China, both because of our own publicity and the masses of people who come here to see things with their own eyes," he says. "We felt that we should let our foreign friends learn more about our preservation work." The U.S. was also a natural destination, he says, because of the successful cooperation between the Palace Museum and the New Yorkbased World Monuments Fund on preserving the Qianlong Garden, which began in 2002. So far one building, the Juanqinzhai  the Studio of Exhaustion from Diligent Service  has been restored. That structure includes a small living space with standing mirrors  a novelty at the time  and a small theater where the Emperor could have enjoyed performances. Massive murals depicting palace buildings, magpies, cranes and a bamboo trellis with trompe l'oeil images of wisteria that appear to hang from the ceiling were removed for cleaning and touch-ups. Specialists restored frames that had been carved from zitan, a rare wood, to resemble bamboo, and artisans in south China recreated fabrics and upholstery based on original designs. Extending such efforts to the rest of the Qianlong Garden will not be easy. In Fuwange, the Pavilion of Achieving Hopes, which lies just to the south of the restored Juanqinzhai, the floors are barren, the wallpaper is peeling and one large section of wall looks to the untrained eye like it had burned  damage that was actually caused by lacquer peeling to expose the wood beneath. The restoration of the entire garden is expected to last until 2019. "We don't want to rush through this," says Feng. "We want to move forward steadily." After a century of entropy, the Qianlong Garden will have to wait a little bit longer to see its full glory returned.